TODAY, Thursday, April 18, at 2 PM. Click here for details. More support for Stop & Shop workers, this time from Governor Ned Lamont and Lieutenant Governor Susan Bysiewicz of Connecticut. SUPPORT FOR STRIKING STOP & SHOP MEMBERS IS POURING IN! Support is pouring in for Stop & Shop strikers, not only from all around Massachusetts and New England, but from around the country and even around the world! Stop & Shop customers, community members, and members of other unions are showing their support by bringing food and beverages to the strikers, and by joining the lines and holding signs. STOP & SHOP WORKERS ARE ON STRIKE AS OF 1:00 pm TODAY, THURSDAY, APRIL 11! Please support these hardworking men and women in their fight for a FAIR CONTRACT! STRIKE ALERT: As of 1pm, Thursday April 11th 31,000 Stop & Shop workers across New England are on strike! Despite multi-billion-dollar profits, the company is attempting to enforce takebacks that hurt workers and their families. Stop & Shop members have ANOTHER delegation working on their behalf: the entire Massachusetts delegation to the United States House of Representatives. President Bollen and the negotiating team urge our members to stay united as they fight to win decent contracts with NO give-backs, decent wages, affordable health insurance, and good benefits. In the midst of difficult contract negotiations with Stop & Shop, UFCW members got additional words of encouragement from Massachusetts senator Ed Markey. A SHOUT OUT from Massachusetts senator Elizabeth Warren to UFCW Local 1445, thanking President Jeff Bollen and Secretary-Treasurer Jim Ronayne and ALL Local 1445 families for being in her corner and standing up for working families in New England, and throughout the United States. On Tuesday, March 19, at Telegram.com, Deb Goldberg, Massachusetts State Treasurer, posted a column with words of support and encouragement for Stop & Shop workers and their families. UFCW Local 1445 is currently in contract negotiations with Macy's. The negotiating team is working hard to secure the very best improvements in working conditions and benefits for our more than 1,000 members working in stores located in Boston, Braintree, Natick, Peabody, and Warwick. All five New England UFCW locals are currently engaged in contract negotiations with Stop & Shop. Local 1445 president Jeff Bollen will be posting videos as negotiations continue in order to keep Local 1445 Stop & Shop members updated on the progress - or lack of it - of these important talks. SOLIDARITY is the key to our success. TOGETHER we can demand - and win! - better wages and benefits, especially since the company is profitable ONLY because of the hard work of its employees - LOCAL 1445 MEMBERS! On February 28, Local 1445 members joined with their friends, supporters, customers, and allies to stage a rally at the Macy's store in Downtown Crossing, Boston, to show their support for Macy's members' determination to negotiate a fair contract that recognizes the hard work and commitment our members have invested in this company and that demonstrates - in a meaningful way - the respect these members have earned and are due. 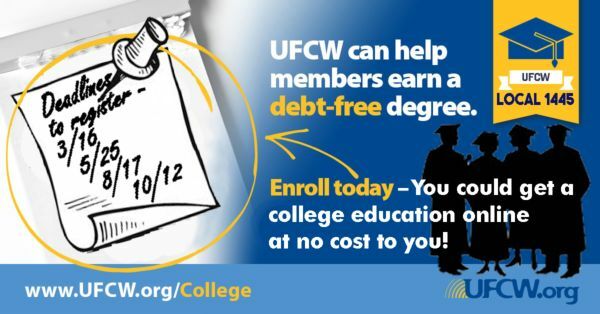 Being a member of the UFCW family means you and your family members can take advantage of the UFCW Free College benefit. 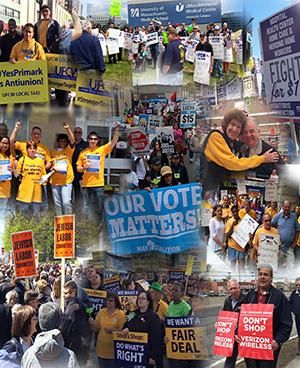 UFCW Local 1445 - 80 years of service and still fighting! Since 1938 - more than 80 years ago - UFCW Local 1445 has been fighting for the rights and dignity of workers and their families in Northeast New England. What do we fight for? Living wages! Affordable quality healthcare! Safe workplaces! Benefits, sick pay, paid holidays and vacations! Overtime and premium pay! DIGNITY AND RESPECT ON THE JOB. President Jeff Bollen has important information for our Stop & Shop members: SAS employees should NOT be doing our bargaining unit work. When outside employees do work that is contractually guaranteed to UFCW Local 1445 members, it means FEWER PAID HOURS for YOU - our members - and, eventually, FEWER JOBS for our members. Local 1445 has vowed to fight this contract violation, but we need your help. 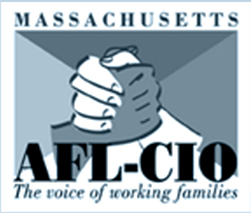 In response to the Supreme Court decision in Janus v. AFSCME Council 31, Massachusetts Attorney General Maura Healey states, "Today, the Supreme Court has turned its back on millions of Americans...My office will never stop fighting to protect working families and basic workplace rights here in Massachusetts and across the country." Richard Trumka, president of the AFL-CIO, has issued a statement condemning the Supreme Court decision in Janus v. AFSCME Council 31. "Until it is overturned, this decision will be a political stain on ... the most honorable, independent body in the world." On Tuesday, May 8, UFCW Local 1445 members and supporters joined hundreds of other demonstrators at the Massachusetts State House to rally support for a $15 minimum wage and paid medical and family leave. Yes! 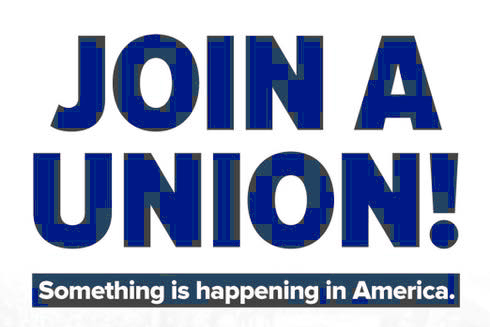 It starts with you, our valued union member, who understands what it means to belong to a union. You have the opportunity to educate your family and friends about the benefits of being an important part of a dedicated group that is working together for a better life...that's organizing! 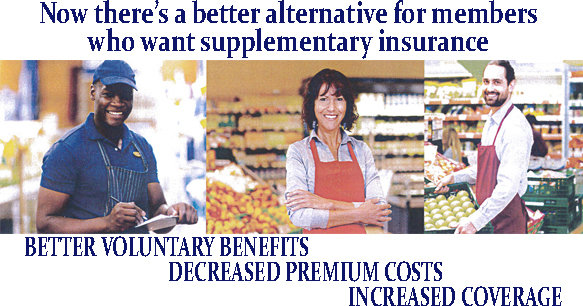 Stop & Shop members now have an alternative to AFLAC for supplemental benefits. The Forza Group, which previously offered Aflac benefits, has now secured an even better alternative for our members through Colonial Life. STOP & SHOP WORKERS ARE ON STRIKE AS OF 1:00 pm TODAY, THURSDAY, APRIL 11! For more, see the video on FB. The Massachusetts Legislature has approved a bill that will take away time-and-a-half pay for retail workers on Sundays and holidays, in spite of the rallies and demonstrations, and the phone calls that deluged the offices of the Senate President and the Speaker of the House. We can't take this lying down! "Workers aren't sitting quietly as the wealthy rig the rules of the economy WE BUILT. We are leading a revolution to demand what we've RIGHTFULLY EARNED." 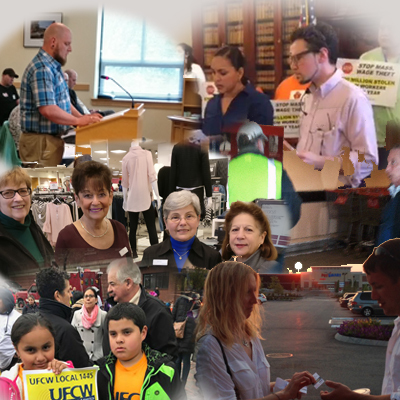 UFCW Local 1445 proudly represents more than 13,000 members in a variety of industries throughout northeastern New England. 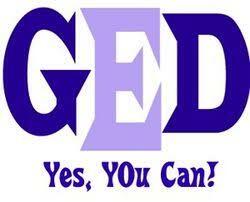 Another GREAT benefit of being a UFCW member - free GED help! Are you a Local 1445 member who has discovered that having a high school diploma can be an enomous advantage in so many different areas of life (including affording a wider range of employment opportunities) but never had the chance to graduate? 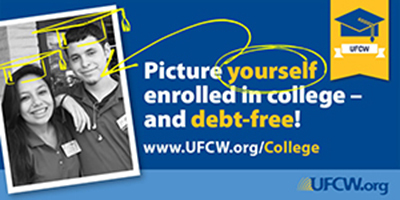 TUITION-FREE COLLEGE for UFCW Members! 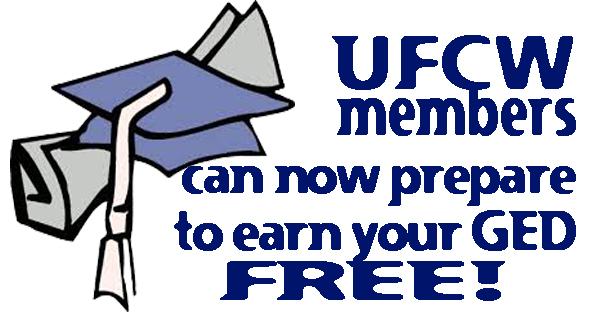 GREAT NEW BENEFIT FOR UFCW MEMBERS AND THEIR FAMILY MEMBERS! You KNOW your union is working to get the very best for you in ALL aspects of your life, and working for a better future for all our members and their families. 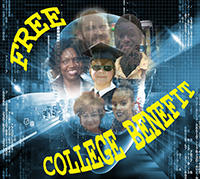 Find out about the FREE college benefit. The UFCW and Eastern Gateway Community College (EGCC) are offering the FREE College Benefit program to all UFCW members or family members who are high school/GED graduates and who want to receive a college degree. Free Help Getting Your GED! If you're a member of Local 1445 who never had a chance to graduate from high school and figure it's too late to do it now, guess what? IT'S NOT! Here's your chance to get FREE help getting your GED!